In 1984, the Transformers brand took the world by storm with its compelling saga of the "Robots in Disguise," and quickly became a childhood rite of passage with a tremendously successful toy line from Hasbro and Takara, comic book series, television program and animated feature film. Twenty years later, the franchise features a popular toy line, an animated series on Cartoon Network and a chart-topping comic book series... and this year, the film! I must say, the new Transformers film is... pretty straightforward; big explosion, corny dialogue and an effects-laden summer blockbuster. I must say, it's better than the rest of the summer blockbuster released to-date! When you hear Optimus Prime's Autobots... ROLL OUT!, it will have goosebumps popping out on your arms... ah, the memories! The film is an eye candy! Visually stunning! Beautiful girls, good looking guys and of course, the machines are slick, and their transformations are virtually seamless. Oh! 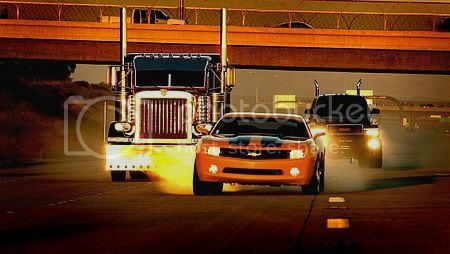 Watch out for the Autobots VS Decepticons scenes! Man... words can't describe it! Interestingly, it isn't just the great visual effects that makes this movie great the storyline is pretty good as well. It'll make you laugh, cheer and you may even shed a tear. However, I have only one complain! The chaaracters in the movie are introduced really fast... almost too frentic. The thing is... Michael Bay managed to capture all this so well and wrap it up in a neat little package! Also, with all things Michael Bay, the actions sequences are pretty intense! Lotsa very loud explosions, insane car chase, and bullets whizzing and sparks flying everywhere! Finally, the actors performances are excellent, most notably newcomer Shia LaBeouf as Sam Witwicky, who really carries the film after a slightly rough start. Overall, go see it... again and again and again...! Bring your friends, your family, your neighbour, even the guy who use to pick on you in school! I reckon this is gotta be THE best movie I've seen for a long time (since Tha Matrix). The movie so perfectly combines the greatest effects, the most incredible sound, and the coolest giant alien robot fights ever captured on film! The only actor who saved the movie was John Turturro... it's funny how the autobots and decepticons were SO much better than the real actors. The whole Transformer movie is light hearted flavor, but when it is a fight scene, they really give a nice blow-by-blow Transformer fights. Though, there are some funny moments with Shia in the movie and I love it like that. That's it! I want to watch it over and over again. [pamie] hahaha.. I gave 5 for the assembled cast (humans and machines), not their 'acting' skills. Megan Fox, isn't too shabby in her 'acting'. hahaha... hard to watch at times but not too shabby. [rob] yeah agreed... Michael Bay and ILM did a good job on the CGI fights. -Pamie The whole Transformer movie is light hearted flavor, but when it is a fight scene, they really give a nice blow-by-blow Transformer fights. Though, there are some funny moments with Shia in the movie and I love it like that. That's it! I want to watch it over and over again. [pamie] hahaha.. I gave 5 for the assembled cast (humans and machines), not their 'acting' skills.